I met Jesus on a mountaintop. I was at Machu Picchu -- a stunningly enormous collection of ruins, high in the Andes mountains here in Peru. We had hiked up and down the mountains that morning, exploring the rocks and gorgeous architecture. I loved looking at the details, tracing my fingertips along the stones, fascinated by the artwork that stood in front of me. But my favourite spot was sitting at the top of the mountain. I had lugged my ukulele on my back all day, and I was determined to find a quiet spot to play it. It was hot and sunny and, though it’s tempting, I’ll do no romanticizing. We sat down in a shaded area, and large mosquitoes devoured my arms and elbows as I played. They hurt and left huge, itchy bites. But take note -- I was determined. I played one of my favourite songs for Jesus on a mountaintop in Peru. People on the mountain walked past us. We kept singing. A woman took a photo of us. We kept singing. An older man whistled alongside us. We kept singing. Lord, I need you. Oh, I need you. There was nothing anyone could do or say that could break that moment for me. There was no mosquito large enough, no sun hot enough, no reason that could unfold me from that sacred moment in the Sacred Valley. Every hour I need you. I didn’t play perfectly -- not even close -- and our voices were soft and breathless from both the altitude and the heat. But we were determined to sing a song to Jesus on that mountaintop. For so many years of my life I have fallen for the lie that Jesus’ love is meant for everyone but me. This has been an enormous struggle. I finally had to make a decision: I could choose to believe the lie I kept falling for, or I could decide that what Jesus said is true -- that he does love me, as I am. This is a choice I make now, even when my heart may not believe it. I chose to believe he loves me when I gaped at the statue of Christo Blanco, high above the city of Cusco. I chose to believe he loves me when our taxi driver, Santos, was kind to us, his name literally translating to the word holy. I chose to believe he loves me while I sang a song to him on the Andes mountains at Machu Picchu. I choose to love him in return. Over and over again, I choose to love him in return. I lettered this verse before we went to Machu Picchu. I read it and thought, yes, this, this is what I want my life to represent. 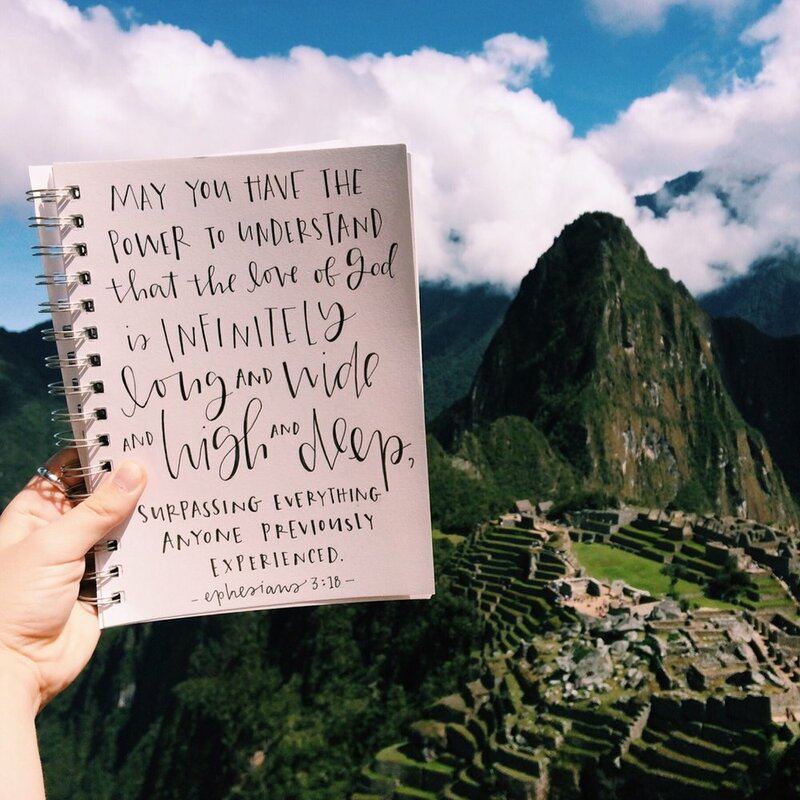 May we have the power to understand that the love of God is infinitely long, and wide, and high, and deep -- even higher than the mountains of Machu Picchu, even wider than the star-spread skies, even deeper than the Atlantic ocean -- surpassing everything any of us have previously experienced. That’s the kind of love we have. I’ll keep choosing that love -- even over oceans and stars and the staggering mountains that fill up Machu Picchu. I don’t ever want to quit choosing that love.